From Scott Nellis: " The majority of my work though influenced by known objects is still my original interpretation of those objects. 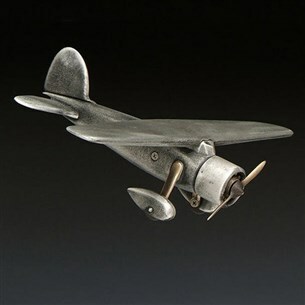 When I was looking for inspiration to create an aircraft toy I came upon the Lockheed Vega from the 1930's. As hard as I might try, I didn't think I could top the look of this beautiful little plane. So I present to you my version of the aircraft that Amelia Earhart used to fly the Atlantic." Dimensions: Wingspan 16" x 10.50 '" Fuselage, 3 lbs.